Pendine Park care home sports stars clinch victory | News by Wales Express News, People Before Profit! A team from a care home in Wrexham were celebrating after winning a tournament playing the Paralympic sport of boccia. Admin Executive and Sports Co-ordinator. Pictured is Matt Palamarczuk presenting the cup to the winning team Gwern Alyn residents Pamela Reed, Bill Evans, Florence Roberts and Marian Williams with cheerleader Olga Ord, staff Yvonne Moran and Olivia Thomas and Cheerleader Doreen Cartwright. 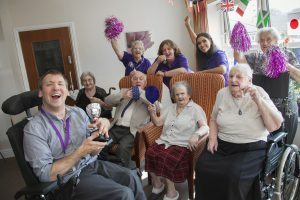 The residents of Gwern Alyn, which is part of the Pendine Park care organisation, clinched gold after a hard-fought competition. The target ball game which is similar to bowls was originally devised for athletes with disabilities that have a major impact on motor skills. The tournament was organised by admin assistant Matt Palamarczuk who is also a qualified paralympic boccia coach. Earlier this year Matt set up a league of boccia teams at Pendine Park, which is fast becoming a hub of the game in North Wales. In all, teams representing five of the organisation’s care homes took part in the tournament ahead of the Paralympics in Rio. Bill Evans, who skippered the triumphant Gwern Alyn team, said: “Quite simply we are the greatest! I’ve followed Arsenal all my life so I know what winning is all about although I do support Wrexham and Shrewsbury too. According to Pamela Reed, another member of the victorious Gwern Alyn team, she has only recently started playing boccia but enjoys the game. She said: “I enjoy playing boccia and I was thrilled when I was asked to be on the team. It was a sentiment echoed by Bryn Bella resident Tracey Wilde, said: “It was good fun and great meeting residents of the other are homes. Doreen Cartwright, of Hillbury Care Home, got into the Paralympic spirit. Activities and enrichment co-ordinator Nicky Clarke said: “The matches were played over two days and everyone has had a great time.